Multiple patterning and 3D NAND drive demand as the number of vacuum process steps are expected to increase. Vacuum pumps, pressure gauges and vacuum valves combined make up the biggest expense on the bill of materials for semiconductor OEMs. In 2017, almost $2.5 billion worth of vacuum subsystems were consumed by the semiconductor industry with over half supplied by vendors based in Europe. Vacuum subsystems sales account for one third of expenditure on all critical subsystems used in semiconductor manufacturing equipment (excluding optical subsystems). 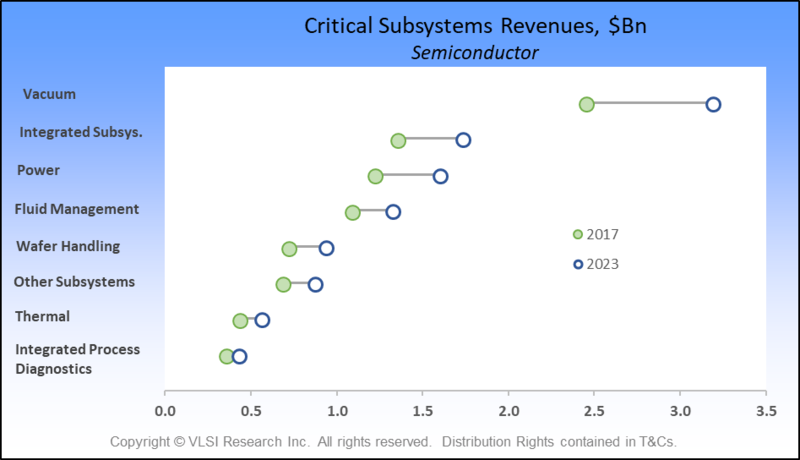 The increase in vacuum process intensity of the semiconductor industry means that, by 2023, the market for vacuum subsystems could top $3.1 billion. The growing number of vacuum process steps has been driven by multiple patterning and the successful introduction of 3D NAND. Both require additional deposition and etch steps and, in the case of 3D NAND, longer and more difficult etch processes. On the negative side, this has increased costs for chipmakers and is driving the adoption of Extreme Ultraviolet lithography (EUV), which reduces the reliance on multiple patterning. However, even with EUV (which is a vacuum process), the number of deposition and etch steps are still expected to increase, albeit at a lower rate. This explains why the forecast is for sales of vacuum subsystems to outgrow the market over the next five years. 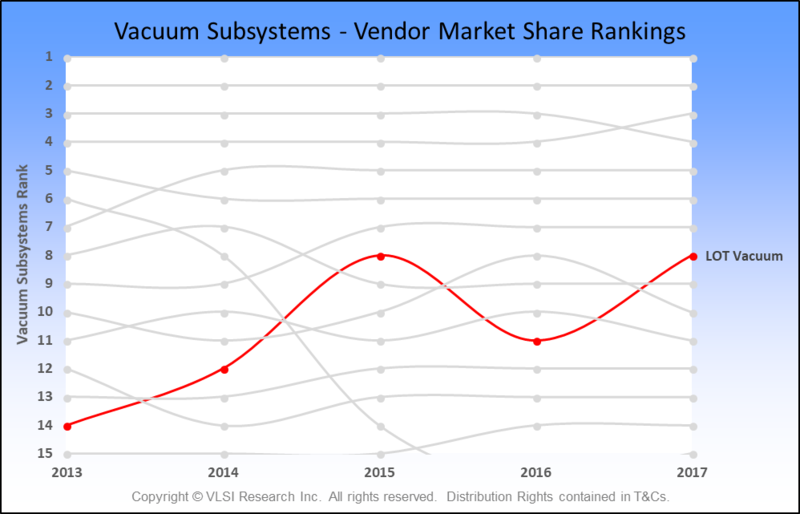 The top five vacuum subsystem suppliers account for 60 percent of the market, dominated by four European based vendors. In 2017, over 54 percent of all vacuum subsystems were sold by European companies, reflecting the European origins of vacuum technology. The Japanese vendors as a group make up 26 percent of the total while North American vendors supply 13 percent. There is a push for more localization of vacuum subsystem supply, especially in Korea and China. LOT Vacuum, a Korean based vacuum pump supplier, has been making strides recently and climbed the rankings to 8th place from a previous ranking of 14th in 2013. After a hiatus in 2016 LOT, has returned to 8th place after gaining 1.5 percent market share in the last year. However, the strong hold that Europeans and Japanese have on the technology mean that we are unlikely to see any meaningful regional shifts in supply in the foreseeable future. We expect vacuum subsystems suppliers to continue to make a valuable contribution to semiconductor manufacturing over the long-term as the trend for more vacuum process steps continues. Julian West is a technical and market analyst at VLSI Research Europe.